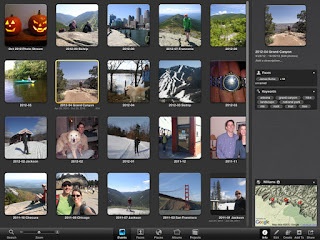 iPhoto is a great place to manage digital assets. As a Mac user, I use iPhoto for organizing all of my digital assets (photos and iPhone videos at least). I also use Time Machine to back up my Mac on a regular basis. Here is where a problem arises - by default, the iPhoto library is seen as a single file - in my case a 50GB single file. If I add one photo to the library, the library is then seen as having changed from the last backup and Time Machine will save another copy of the 50GB file. This will quickly reduce the number of backups I can put on a single drive. Also if I want to find a single photo in the archive - there is no way to restore individual photos, just the entire iPhoto Library. My solution: separate the photos from the library. To do this, I export all the images out of the iPhoto Library and place them in a directory that Time Machine has access to. Much the same way iTunes organizes music. Before I export, I organize and name my Events in a way that will make sense going forward. I have an event for each month and name it YEAR NUMBER-MONTH NUMBER. Once all of my events are organized properly, I select all of my events and export. Under the File Export Tab in the export window, I choose "Original" for Kind, "Use filename" for File Name and "Event Name" for Subfolder Format. This will move all of the photos into directories that mimic the Events set up in iPhoto. Once all of my photos are exported, I do a spot check to confirm that all images made it to the directories, and then delete all of the photos in the iPhoto Library. Before I import all the photos back in, I open Advanced Preferences and uncheck the box next to "Copy items to the iPhoto Library" next to "Importing:". Now all you need to do is drag all of your folders that were created with Event Names into iPhoto - all the Photos will go in under their appropriate Events. Your iPhoto Library now holds only the metadata about your photos and not the photos themselves. This makes iPhoto faster to open / close and backups using Time Machine are much more efficient. Thanks for the article - really great idea. When you import new photos in the future, do you then copy them into the place you originally exported the files to and then import it from there? You wouldn't be able to use the iPhoto import button on the top right would you? Daniel, I have been using the Import button on the top right when I connect a camera or my iPhone. I do this because it keeps things a little more organized with iPhoto usually pulling images directly in from my iPhoto Photo Stream. At the end of each month, I export the photos for that month, delete them from the internal library then import the photos from the local directory. This process, although more involved than the standard process, allows me to back up my local photo directories rather than one extremely large iPhoto Library file.